“In Durham, people love diversity. They love economic diversity. They love racial diversity. They love age diversity. So, in Durham, we can do projects that are just more interesting." Development always impacts a city. Sometimes it can enhance the existing character of a place, building on its spirit as well as on its land. It can be development with a difference. Take, for instance, Eleven Townhomes in Old Five Points. These units feature a flexible ground floor space that can be a rental. The Yancey Street Condos include wide range of square footage, from 420 to 1200, yielding a variety of prices and inviting residents with a diversity of incomes. Scott Harmon and David Arneson are the two developers behind these these thoughtful projects, as well as others that seem to interact with Durham in a positive way. The pair made time to discuss with me their projects and their relationship with Durham. Neither one was short on personality and we had a really fun and lively conversation. Both Scott and David started their careers in other states, but landed in the Triangle. In the early 2000s, both were working on private houses. Scott was bringing in more business than he could handle as a one-person shop. Meanwhile, David, who just wants to "sit in front of a computer and draw badass buildings,” was working at a firm that needed to bring in more clients. It didn't take long for a collaboration to develop, and they worked on a few projects while working at separate firms. A year later, David was ready to set out on his own and started Center Studio Architecture. Both David and Scott were working from home and meeting at Fowler's (now Parker & Otis) and taking on architectural clients. Scott’s long held interest in development led him to create ReVamp Durham. The two companies, ReVamp and Center Studio, collaborated on their first condo project, Mangum 506, securing financing right before the financial crisis. The downturn lengthened timelines and tightened budgets, but Scott and David powered through. It wasn’t long before they simplified their business relationship and split both companies 50/50. They soon decided to build out their own office space and found the perfect location in the Five Points area. They bought their building from the city in the middle of the economic downturn. It was in poor condition; even the roof was caving in. David and Scott were able to finance the project by finding six other owners, creating a co-development and finding a local lender. In a lot of ways, the origins of Center Studio Architecture and ReVamp are very “Durham.” It was a story about collaboration, entrepreneurship, with a touch of grittiness to operate through downtown Durham's renaissance. Scott got his first taste of development working with White Oak Properties to put townhouses on that land he had acquired. His role was to get the land rezoned because he was so well-connected with the community and with the city government (meeting Scott and experiencing his outgoing nature, it was easy to see how he developed those connections early on). Since then Scott and David have brought historic buildings back to life. They built out downtown lofts when downtown was still relatively empty. They cut their teeth working on restaurants with Alivia's (now Maverick's) and Toast. "We like working for people who are using the space for something that's important to them. They're living there or it's their restaurant. It's their baby or it's their dream,” said Scott. Now, with ReVamp Durham developing new projects and condos, some of those dreams are their own. This firm knows Durham. They have now been working in the city for over 14 years. As Scott puts it, "When you dedicate yourself to doing good work in one place, when you stay there and see it through, and when you understand the community, your work starts having a life of its own." To date, Scott and David have worked on approximately 16 restaurants, all of them independent venues, and have had a huge impact on the food culture of non-chain restaurants, local chefs and interesting spaces. Additionally, their condo development Church + Main was the first new construction within the downtown loop since the Marriott had been built 25 years earlier. They followed that with Mangum Flats. With both of those projects, Scott and David had very little competition downtown. They were building in downtown Durham when nobody else would. With Eleven Townhomes and Yancey Street Condos in the hopper, Scott and David are thinking a lot about projects that would be good for Durham — addressing the missing middle (housing for people who don't qualify for public housing, but are still feeling an economic squeeze) and creating diverse types of buildings for a diverse market. The wide range of purchase prices and unit sizes imagined for the Yancey Street project was no accident. In discussing their projects, David talked about the idea that they aren't targeting just one market with their buildings: "it's a miniature version of a city." “In the Raleigh market you can't do that,” Scott said. “In Durham, people love diversity. They love economic diversity. They love racial diversity. They love age diversity. So, in Durham, we can do projects that are just more interesting." I find it telling that Scott is planning on living in a townhome in the Eleven development. Scott says he will be listing his flex space in the townhome on AirBnB. Scott and David want to experiment even more. They are very interested in microunits, in jazzing up building exteriors, in changing up the development process, in finding financing for interesting projects that a larger developer wouldn’t touch. They are also looking at areas outside of downtown, where zoning is extremely restrictive. 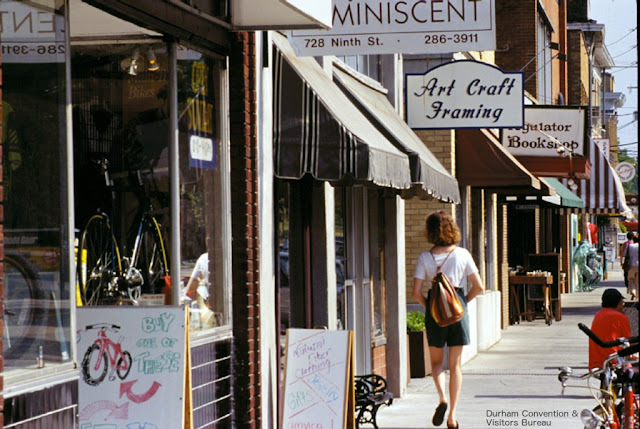 With so many people moving to Durham, with increasing density, they see the need for townhomes and right-sized projects in surrounding areas. The next project? They are partners in a venture that has purchased a lot at 614 Rigsbee Avenue at W. Corporation. Planning is just getting started on that project. Scott summed up the pair’s approach with one question that they are asking themselves: "What can a private sector, market rate developer do to address some of the issues in the community around housing and building? We can't solve all the problems, but Durham's the kind of place where you can try projects that are a little out of the box." Scott and David's purchase of the former city-owned 102 Morris Street property is a great example of local folks continuing to help make Durham into all that it can be. Yes, the roof was leaking, and the beams holding up the ceiling were severely cracked. But look at it now (not necessarily the exterior aesthetics). No longer vacant and derelict. Several businesses. Jobs. Yeah. Cool interview. Good firm that does decent work, although it's really not as varied as they've made it out to be, and there are plenty of other local firms that I'd rather see stepping into development. In any case, it's always better than outside developers shaping our city when they don't have any skin in the game. Unrelated tip: check out the renderings on display in the new Legacy Tower lobby... they're showing off (probably far-off) future plans for a new hotel and apartments/retail surrounding the tower at Mutual Life Plaza. Don't think these have been posted anywhere online. I'd love to hear more about local firms that are well-positioned to step into development. I love connecting with people who have a stake in the area! Also - I will stop by the Legacy Tower lobby at some point and check it out. Thanks for the tip! I'm glad to hear that. I'd love to see the building footprint expanded out to the sidewalk and the parking lot/deck south of the building redeveloped into something more interesting, while keeping the tower in place.